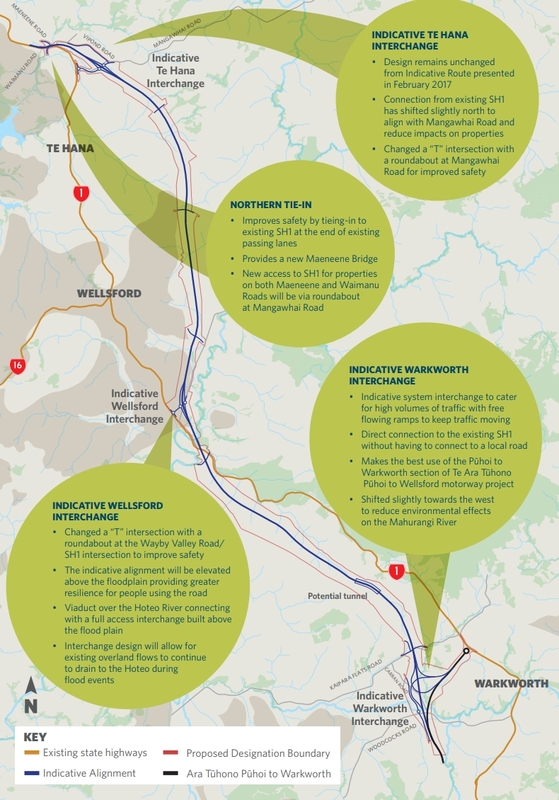 Just before Christmas the NZTA announced they were working on route protection for the Warkworth to Wellsford project with the formal consenting process likely to kick of within the next month or two. The project is the second stage of one of the previous government’s seven Roads of National Significance and the first stage, from Puhoi to Warkworth, is currently carving through hillsides and filling in gullies and is due for completion in late 2021. This is happening despite the project not being a priority under current government policy and even the NZTA admitting that construction on the project “remains at least 10 years away“. This is also at a time when the NZTA appear to be in disarray and struggling to prioritise funding for a huge number of critical projects urgently need all around the country. It makes me wonder if they’re trying to build up a backlog of motorways ready to go should we have a change of government within that time frame. But it’s hard to see how the project will ever stack up under a rational analysis. The indicative alignment is about 26km long through some very difficult terrain and includes an 850m long, twin-bore tunnel as well as three full interchanges. The NZTA told me “the updated cost estimate of the new Warkworth to Wellsford alignment will be included in the business case when it’s presented to the NZ Transport Agency Board later this year” but previous estimates have put it over $1 billion. Given the construction cost increases since then the cost could be a lot higher. That cost might be okay if it was a well-used piece of road but the most recent data publicly available, from 2017, shows traffic volumes just north of Wellsford at just over 11k vehicles per day and between Wellsford and Warkworth at just over 12k per day. There are many state highways with higher volumes, higher growth and easier construction costs that we aren’t talking about turning into motorways. Also as a comparison, the Puhoi to Warkworth section costs less (about $700m), has about twice the vehicle volumes and it only had a BCR that returned 90c to $1 for every $1 it costs. Of course, proponents of the project will note that SH1 is the key link between Auckland and Northland, and a resilient link is important, but resilience can be provided in other ways, like through safety improvements – some of which are currently underway. What’s of most interest right now though is the current indicative alignment the NZTA are looking to consent. There have been some changes to parts of the project from what was presented in 2017. 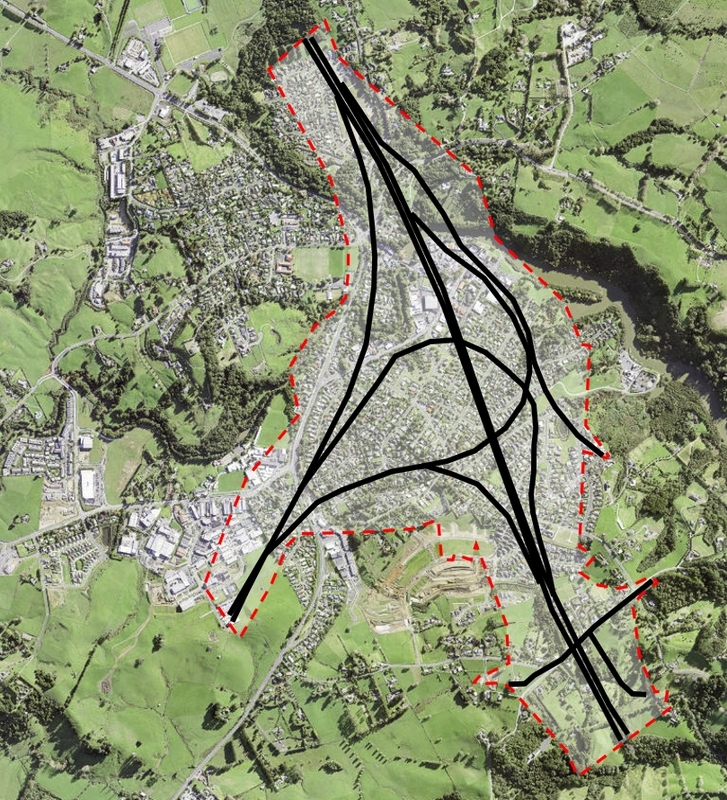 These include a revised Warkworth Interchange, a shift in the alignment of the tunnel and new location for where the route connects back into the existing state highway at the northern end. Consideration has also been given to how the project might be constructed, including how the site is accessed and how large quantities of earthworks are managed. Permanent features of the project like stormwater treatment ponds and areas for landscape and vegetation planting have also been considered. All of this has resulted in the proposed designation boundary shown on the map. Final refinements are now being made to the proposed designation boundary, taking into account feedback from ongoing landowner engagement. There’s a much more detailed version of the indicative alignment here and it also shows where there are likely to be some of the large cuts and fill sections. One of the aspects of the design that really stood out to me was the sheer size of the Warkworth interchange that is now planned. The previous version showed the motorway just veering off but now the NZTA have changed this to a full motorway to motorway interchange, perhaps reflective of the fact they’re building connection to Warkworth to motorway standard. 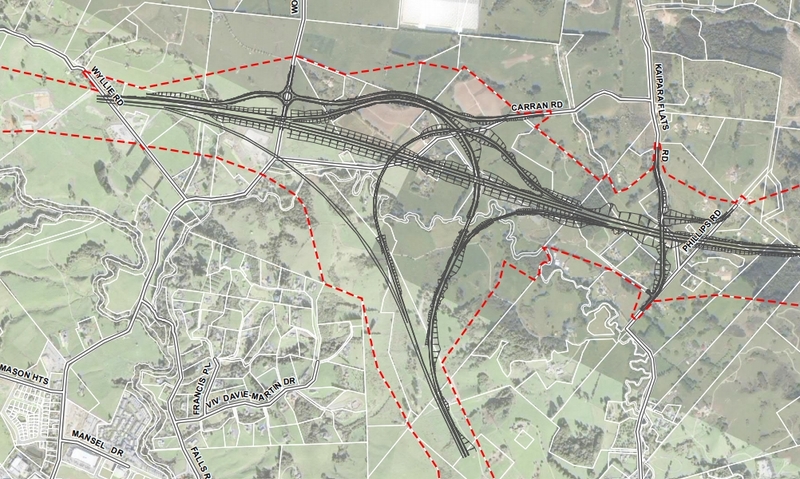 The proposed interchange is so massive and you can nearly fit all of Warkworth within it’s footprint. Below I’ve matched things to scale as much as possible and rotated it around a bit but you can see the result. It’s worth noting that as of the most recent numbers from Stats NZ, the urban area of Warkworth has nearly 5,000 people living int it. 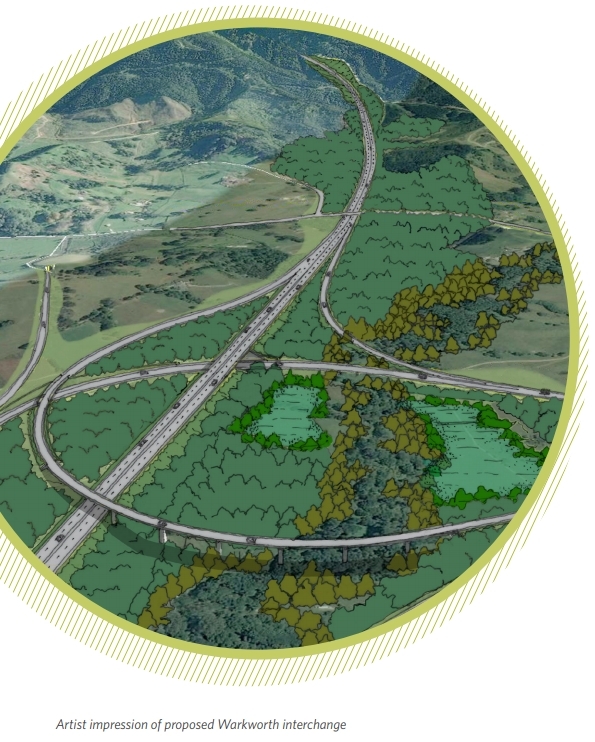 By comparison, the NZTA in their early artistic impression present it as a motorway in the middle of a forest. As mentioned, we’re bound to hear more about this project in the coming months as the NZTA move towards lodging consent. This should be a simple motorway interchange, not full free-flow. A roundabout in the British style would take about one-tenth of the space this monstrosity is taking, and since most of the traffic will be south-to-east (and vice versa), there won’t be much conflict. What’s the process for public protest? How do we get NZTA to pay attention? They got a taste for sweeping aerial boulevards at Waterview and they ain’t going back! That is, what, 400m radius? That is stupidly large even for a motorway to motorway interchange. Just measured the curves on motorway interchanges around where I grew up. The large ones have about 250m, one of them has only 150m. IIRC that one requires slowing down to about 60 km/h. Agreed, the direct ramps are over the top. There are plenty of direct ramps where I currently reside but they are all motorway to motorway connections. More business-as-usual road building that will induce traffic and leave our children paying for more carbon credits due to a more carbon-emitting car-dependent public, as well as having to maintain more roads and more sprawl. Altogether crap. And number one benefit listed being travel times when they’re unethically and erroneously misapplying the traffic models to calculate these shows how the government has to quickly change process here. The highway should be understated. It should neither draw attention to itself, nor be an unattractive foreground. While the Warkworth to Wellsford section passes through different landscapes, it is a continuation of the Pūhoi to Wellsford project which will provide a seamless experience in terms of the highway itself. Differences in character along the route should unfold in the landscape, free from distraction. The highway should convey a refined and minimalist aesthetic with carefully designed details. Laugh me out the door. I am very pleased that they are planning for the future. Too much of New Zealand’s infrastructure is thought about after it’s too late. Should be much more of this level of planning across the whole country. That way property owners have certainty about what will happen at some point. It’s better to over plan and make sure that the design supports long-term growth whilst the land is cheap. That’s how I feel too. There has been a lot of uncertainty and worry around what might be taken. Which part of climate change are they planning for? What’s climate change got to do with making roads safer to drive on? Oh, is that what you thought this project was? Then I could understand your point. But no, it’s not making the existing road safer. It’s leaving that as it is. And building a completely new road, which adds capacity, inducing traffic and sprawl. I disagree it’s making a not so good road into a much better road. And so what if it’s a holiday highway, during holidays this road becomes a carpark. So planning for the future is continuing with the past? If we were planning infrastructure for the future then surely we’d focus first on what the future will, or more importantly SHOULD look like. Will Freight change? Will the way we travel change? Will connections between regions look the same in the future? Isn’t that planning for the future, not just throwing down more concrete against terrible Business Cases. Not saying don’t build roads but even if their wasn’t such thing as climate change, should we really just continue with rehashing the past and call it ‘planning for the future’? Joe, this is an excellent point. When I was born NZ couldn’t afford to import new cars because of our worsening balance of payments deficit. Inter city travel by bus, and bus tours were much more prevalent. Will the changing face of agriculture mean that importation of the same volume of evs is beyond us? What constraint will the climate change spending requirements of the 2020s and beyond place on overall government spending. We have seen just a few examples in the press of costs that we will face. It will cost about $200 million to “save” Petone from rising sea waters. Adverse weather events will cost about 2% of gdp. As you say, it is little point in continuing to behave as we have in our recent past if that is not appropriate for our future. That’s not really correct, a bit of ad libbing here. People in NZ could afford new cars, you just had to have overseas funds to get them. Plenty of kiwis did, when my mum was growing up my grandparents used to buy new cars every couple of years. While they’re road building in the area a tunnel under the Brynderwyns would be a really super idea. Let me guess, you are Shane Jones, the only Master Chief I know. It just makes sense, it’s much more efficient for any vehicle to go through the mountain than drive up and over it. Where I currently live that is what the govt is doing, replacing mountain passes and ferries with tunnels and bridges. The Norwegian govt is spending over 60 billion NZD in the next decade on bridges and tunnels on just the E39. There’s 10’s of billions more being spent on the rest of the country as well. You can do this when you have an extremely large pot of oil funded money to pad out the budget. Exactly, but we don’t have oil money. We could have if we didn’t have a shortsighted govt. Of course cos governments create geology (you may recall Joyce thought he could make oil appear by giving away royalties, and nope, didn’t happen), and even more importantly, we can just keep frying the atmosphere with buried carbon. Gah. Master or chief of who knows what but it ain’t logic or reason…. If there was loads of money in our oil fields we would be rolling in it by now. Norway has got rich off oil that is easy to extract, we have fields that are difficult to extract from and at best have about a 20 % chance of ever producing viable oil. It’s worth remembering National rolled out the red carpet for explorers during their last term by offering very low royalties, we were never going to get rich even if oil was found. The explorers turned up and even with record prices couldn’t make it pay. Why would we risk a deep sea oil rig failure for the pathetic royalties we would have received? We did have a short sited government between 2008 and 2017 and we still didn’t get rich. The Warkworth interchange is absurd. They could easily use a far more compact interchange, such as one like the Highbrook Drive interchange. Moreover, given that this motorway is highly unlikely to be built, why are they still seeking a designation and consents? Would their resources not be better used on current projects like Auckland Light Rail? Exactly. Shouldn’t the very resources of the NZTA staff time be being applied in alignment with the GPS? It looks like some in the agency prefer to imagine they are operating under another GPS, fairly risky, I’d have thought…. Need a post about the legal, reputational, career and professional body risks? Why should all the money be spent in Auckland, there are other parts on NZ outside of Auckland which also require fixing. I can understand why people outside of Auckland resent all the money being spent in Auckland. I never really took much notice of this when I lived in Auckland, now I’m out I can see it. I wouldn’t say spending money in Warkworth is really spending money outside of Auckland. If you can explain exactly what we are fixing with this motorway and how it stacks up financially i’d be keen to know your thoughts? Money should be spent where it makes sense and spent per capita. Why such a big junction, I get that that they need to ark it out and around to cross the motorway at a 90° angle so any bridge over the highway is short. But I’m sure they could keep it cheap by keeping it tight and maybe use a couple of cable stay bridges to cross the highway at say a 30° angle to the highway. Playing devil’s advocate, this is supposed to assist in unlocking Northland’s potential. Trouble is, apart from the cost and environmental damage, once anyone gets near Auckland, South bound, it all turns bad. There’s no overcoming that using roads. “Unlocking Northland”, like you say Nick, is buzz words, meaningless. Auckland to Tauranga is 2hr 40mins over a road that is not outstanding in places – not that I want NZTA to spend billions on it. Tauranga is obviously doing very nicely. Auckland to Whangerei is 2hr 12mins. What is there to be unlocked? If some are suggesting that Whangerei should be a daily commuter town then surely this is madness? A complete waste of the spending of public resources to benefit a few? As someone suggested earlier, pull the pin on any work, save the money to be spent elsewhere where there is better returns. I think improving access to Northport and a future Ngapuhi treaty settlement will do more for unlocking Auckland than any motorway. There is of course a need to improve the road that links Northland to an important and large market that is Auckland but that doesn’t require a motorway. That’s meant to say unlocking Northland not Auckland! I feel that the only potential unlocked by this type of road design is the potential for Warkworth to sprawl unrestrained in all directions. Just Don’t Do It. Put the money into initiatives which (a) are going to stack up financially, (b) don’t exacerbate climate change, and (c) encourage the use of public transport. End of story. Mr Bridges also defended the previous Government’s plan to invest in bigger highways, saying they’d help fight climate change by making routes more efficient. “We would double-down on infrastructure. Mine would be an infrastructure Government,” said Mr Bridges, calling a scrapped four-lane highway north of Auckland “pretty green”. Why lie, just call it what it is.. I think substantially reducing the population is the only way to sufficiently decarbonise, and I’d rather this than reduce standard of living. Under this assumption the road would never need to be built and it wouldn’t have any benefit. However I assume Bridges’ thinking must be based on the assumption that population and standard of living will continue to increase, and that fossil fuel alternatives like hydrogen or battery technology will be developed as required. On this basis, where is the lie? Reducing distance, easing grades, eliminating stop/start all improve transport efficiency and reduce fuel burnt or energy expended. This is not a serious question, is it? You don’t seriously believe that the road is intended for the same number of cars, only they are driving to Whangerei by a slightly more direct route? There will inevitably be more cars and hence more emissions. I suspect that the thinking went as deeply as this. One of his colleagues said, every time I drive back from Omaha the road is clogged. Absolutely right, it is on most Saturdays and Sundays during the summer. Is that a reason to build roads everywhere for a traffic flow that averages 11,000? It is a tragedy that much of NZ politics is about the promotion of the interests of a few at the expense of wider more considered progress- gun reform comes to mind. i think the comment is more disingenuous than that. Bridges was outright denying the science. The evidence is solid that a “plan to invest in bigger highways, saying they’d help fight climate change by making routes more efficient” is fantasy. Bigger highways induce traffic and exacerbate climate change. “It makes a lot of sense from any perspective.” is just more of the “common sense” rhetoric we’ve had from them for years. NZ needs National to shift on this. We need both major parties to be on the same page about climate change and about how damaging road building is. The risk for our children is too great to be wasting this opportunity. Labour also has to understand the role that greenfields development plays in climate change, and stop promoting that. There are plenty of different ways to achieve the changes we need – the parties can offer points of difference about which way. But less travel, less sprawl, and reducing our carbon emissions has to have broad support from all parties. the length of time that it is taking to reach consensus regarding climate change is worrying. Is it possible that in 5 or 6 years someone will be saying, if we realised the consequences we might have done it differently. Wellsford simply needs to be bypassed. That will remove the stop-start. It doesn’t need a massive interchange. That interchange is hideous. Can save about a hundred million just by redesigning it so it isn’t the size of a small town. Has this not been scrapped yet? Such projects are never scrapped. They go on hold during governments that don’t support them, then come back to life when one comes along that does. The RoNS were/are primarily about keeping the construction industry afloat. And the finance industry, poor dears. If a mere 11,000vpd is all it takes to justify an expressway be built then some better candidates are SH2 Pokeno to Tauranga or SH1 Christchurch to Ashburton. The inconsistency of NZTA’s approach just shows what a shambles they are in. The Hawkes Bay expressway also comes to mind. This is awful! And such a waste of time, money and resources for anyone to be looking at it presently. I have close family in Whangarei, a bach around Mangawhai, and I live in Auckland (so I guess I’m kind of ‘target market’ for this road) and I can say with certainty that it would be a bad thing. You know what I’d much rather have available? A train that I could take on a Friday night after work to visit either of those places, with taxis or car-share available at the other end to get me the last little bit of the way. Could that be done with the same money? I haven’t looked at numbers, but what you’d need to weigh up is whether the train as you’ve suggested is cheaper than this road plus all the incremental widening it will receive as they continue on the blind path of road building, plus the maintenance that it will need, plus all the other environmental damage it’ll do and the social severance and public health damage… And it would certainly be cheaper than having to pay for carbon credits and fuel into eternity. Maybe there will be even better options than taxis or car share available at the train station. The last piece that I read on the Devonport million dollar shuttle is that it has been so successful that it will be rolled out in other areas and if they are less well off suburbs, then the price point will be reduced. In some countries the price of road tolls means that it is cheaper to take an intercity bus or train rather than drive. That is certainly a way to start to reduce carbon emissions. @ HJ – “such a waste of time, money and resources”. We have the same problem down here north of Wellington with the completed Kapiti Expressway requiring major repairs after only a few years, Transmission Gully forging ahead, despite NZTA’s own predictions of induced traffic flooding into Wellington, Peka Peka to Otaki now underway, and Otaki to North of Levin on the books. At least the latter has been scaled down by the present government to 2-lanes only, given that existing traffic along that stretch (2017) was only 17277 average/day, both directions. To succeed economically, these roads need to generate heaps more traffic. But apart from a big earthquake, this is the last thing the Wellington Region needs. Then NZTA needs new strategic direction & a complete review of its priorities. steven joyces plants are deeply embedded into NZTA. Wholesale changes are needed to replect the new GPS. NZTA need to redo their SH1 freight estimates in light of the government’s intended North Auckland Line rail upgrade. It should be more than a passing consideration. Seems this was just a task within the overall project which itself will take some time to stop like a ship at sea when the National Party was at the helm & the skipper has now jumped overboard… probably swimming towards some irrelevant tropical island. Except that at Waitangi this year, Ministers were told over and over again by local iwi leaders that they wanted the road built. Kia ora, thankyou for highlighting the stupidity of this monstrous interchange. The bypass to Warkworth that is currently under construction is but a small scratch on the landscape compared to what is planned. At a time when the community is wanting to protect our Waterways how can this plan go ahead? Do people actually realise what they could lose? At the public meeting held recently in Warkworth to discuss the plan, the 3D model that was presented did not even have the river visible! I pointed this out and they said it was just a mistake, but if you want to pull the wool over the publics eyes this is one way to do it. The loss of a potential beautiful walkway/cycleway along the banks of the left branch of the Mahurangi River, with mature Totora, Kahikatea and birdlife such as Kaka, Kereru, and even Kookaburra is at stake here. I will do all that is possible to raise awareness of how stupid this plan is, and try to provide some sensible alternatives for the future.